So, I decided to enter the 2009 Margo Anderson’s Patterns Iron Dress competition. I’ll be entering an ensemble for the husband. The idea is to use only what you have on hand, and the three fabric tubs in the closet pretty much demand that I enter. The competition runs today through Sept. 15. Ideally, I would have his ensemble ready for PARF’s opening day, but rushing hardly yields superior results. I also haven’t planned exactly what materials I’ll be using for his doublet, which doesn’t help. Hopefully, a day-to-day analysis will keep me focused. The competition officially starts today. 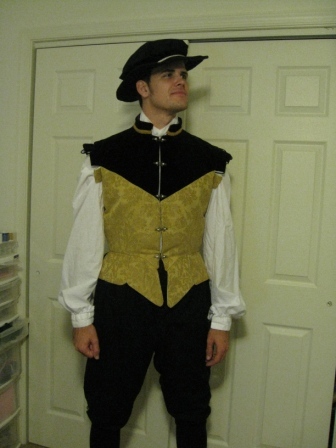 So far, I know that I’m starting with Venetian Breeches (View A). They’ll be made of the leftover black cotton twill that I used for the Ravens kilt. Today’s goal was to get the measurements done, but the hubby is still running a raid, and I’m going to bed. 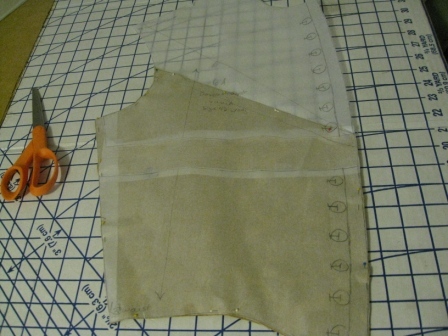 I got the breeches pattern pieces out–I used them for my pyratical pants, so they were already bundled. This has been an unproductive week for the project. I finally measured him, but haven’t done any thing close to work. I wanted to finish some odds and ends on my own ensemble so that I could pack all of the scraps and pieces away to start with a clear workspace. Today, I’ve finished the measurements, and I’m doing the pattern alterations. I use standard tracing paper for all my alterations–aside from the small width when it comes to pants, I haven’t found anything that I like better. I had to lengthen the top by 4 inches, which makes the fly about 11 inches long. I hope to have the lining/mock-up tested by the end of the day. No dice on getting a mock-up completed yesterday–I kept getting distracted. Today’s goal is to get the mock-up done and tested. 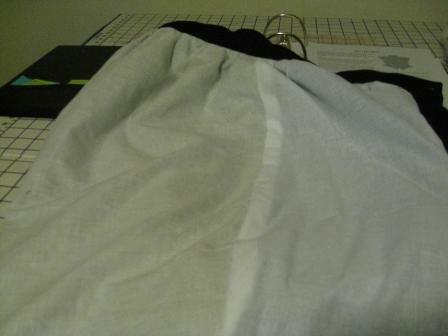 One-half of a fabric tub is from the remnant bin at JoAnn’s, so I’ll be using a white cotton remnant for the lining. Finally, progress! It turns out that I’m using three different white cotton remnants for the lining. The mock-up fits appropriately, and I can start cutting fashion fabric for the breeches. I only had to lengthen the top crotch section; the length through the leg is perfect. 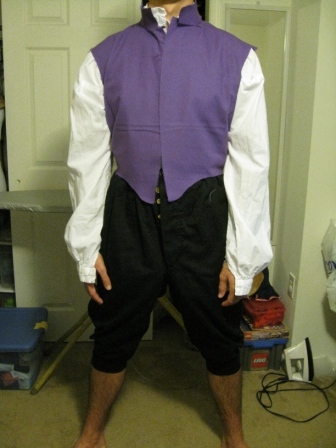 At this point, I’d like to get the breeches done, then get a hat made (same material) so that he has something to wear for the faire opening. The doublet is still going to take some planning, so that will get completed at some point before the end of the competition. I cut the fabric for the breeches and started construction of the fly. It’s too late for the machine, so I’ve gotten the prep work done and can start right on the stitching tomorrow. I managed to stay focused for a few more hours this weekend. 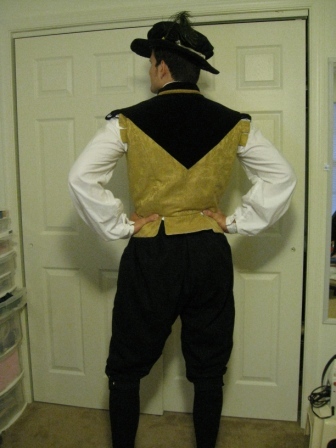 The breeches are constructed up to the waist band. I need to secure the lining and I believe the leg bands are next. I went with a concealed fly to avoid shopping for (or making) buttons, and I’ll be using a set from my infamous bucket-o-buttons. This may be the first time that I’ve used the buttons for their intended purpose rather than for decoration. I should be able to finish the breeches over the next couple of nights. I’m definitely behind schedule, so I’d like to get the doublet pattern re-sized this weekend. Kind of a late night, but I managed to get almost everything done. I have to sew on the buttons, then I can concentrate on the doublet, for which I have yet to form an image in my head. I didn’t gather the legbands, which ended up being too long for the legs of the breeches. Instead, I centered the bands on the inside seams and slipstitched the excess to itself. I marked placement for the buttons below the knee, but I plan to add a second button for above the knee just in case. 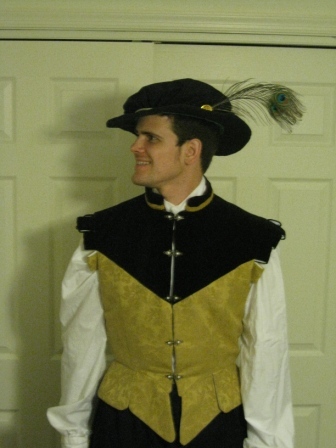 I had planned to move onto a hat next, but I really want to get the doublet started. He doesn’t really need a hat. Scratch the second button on the leg bands – that’s silly. The breeches are done and have been tried on much to our pleasure. They are now hanging in the closet – yay! On to the doublet…I’m still undecided on the fabrics and their placement, but I need to get through fitting first anyway. 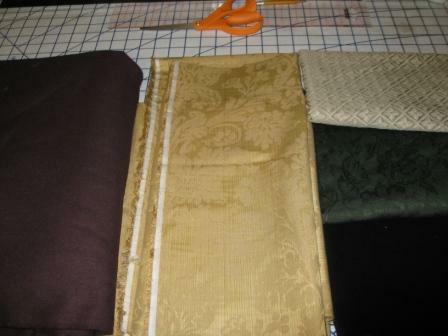 Tonight’s goals are simple: cut the pattern pieces, decide which remnant(s) to use for the lining. Update: The pattern pieces have been cut, and I believe I have enough white cotton remnants for the lining. While the hubby didn’t get shorter since last year’s doublet was made, it *seems* that I won’t need to lengthen the doublet pattern at all. Once I assemble the mock-up over the next couple of days, I’ll know for sure. Last year’s doublet was lengthened by 1.5 inches. 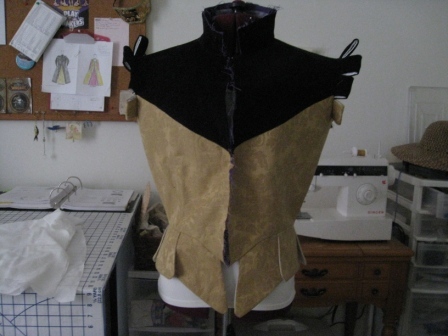 Taking a look into my fashion fabric tub hasn’t made me anymore sure of what this doublet will look like. In addition to the lining fabric, I pulled out a heavier weight yellow linen for [probable] flatlining, which I may have to switch out with remnants of duck–I hope not, because that will not be fun. For fashion fabric, I’m testing (1) a diamond pattern for the doublet front only (just enough leftover from last year’s forepart), (2) this year’s gold damask for most of the body (minus the front piece), (3) black velvet for the front only (purchased for his hat last year, which never made it to construction), (4) a green rose damask for the front piece only (leftover from a Robinette Hood skirt I pieced for a friend), and (5) a [bruise] purple wool for the entire doublet (more than enough remaining from the my wool cloak). I’ll let the hubby mull over his choices tomorrow–he’s wearing it, so it’s only fair. 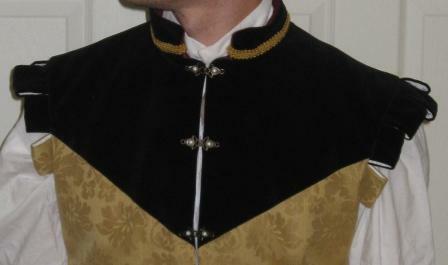 The executive decision has been made: gold damask doublet with black velvet shoulders. It’s going to take some piecing, but it should be very nice. I am switching to View A, and should have the mock-up cut between today and tomorrow. So, disaster struck–the mock-up went together easily, but didn’t fit. I think he’s been working out too much, because I know I measured him properly, as always. I am working on altering the pattern to a 44 chest and adding length of 1.5 inches, the length I figured I’d have to add anyway. I’m cutting this version from the flatlining fabric–a remnant of purple duck cloth. If this one doesn’t fit, I can try one more set of adjustments with the interlining (heavy linen in yellow), although I don’t like adding that extra layer to his clothes. The second fitting went well, and this cut of the pattern is the one. Now, I just have to figure out what the doublet’s going to look like. I’ll be doing some layouts with whatever trim I can find over the next couple of days, with the hope of cutting on Saturday. 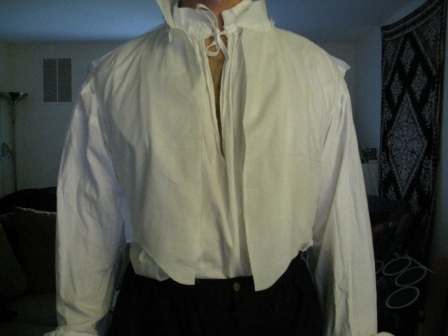 I don’t plan on using interlining, and I may not bone the doublet either. I’ve been scouring books and websites for inspiration on where to start the velvet, but I haven’t struck anything I like just yet. 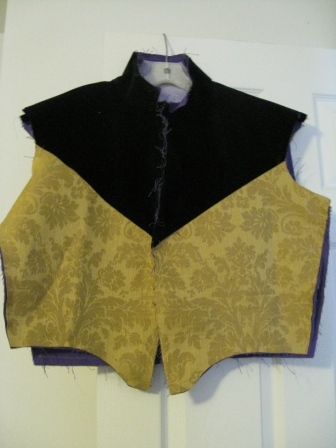 I may start the velvet at the bottom of the arm hole, like the padded leather doublet (125) in Patterns of Fashion. I didn’t get much during the week, so I did a slightly procrastinated version of a full court press this weekend. Minus a few distractions and a few temper tantrums (“ARGH” to piecing, and double “ARGH” to velvet and its whole family), I have reached the tabbed skirting portion of the project. After many combined hours of looking through scraps and my ribbon bucket for trim, I ended up without any. While I don’t like to do it, I will have to depend on the fabric itself for now and hope that I have a really creative dream about it. Currently, the looped tabs are plan, as the tabs will be. If it comes down to it, I can make billiments out of my bucket-o-buttons. That basically leaves lining and front closure, I think. I may have to jump into $25 allowance for buttons, but I’d prefer not to. I don’t count sleeves, because I never plan for sleeves. I hope to have the skirting done and *crosses fingers* attached tomorrow. If I stay on schedule, lining will be Tuesday, and the buttons will be by Saturday. In an ideal world, I can whip up a hat on Saturday as well. Tabbed skirting is done and attached. I wasn’t going to mention that I managed to make three of the same front tab before realizing that I was just leaving the wrong end open before turning. I will post pictures at some point–they look like mini Christmas stockings. The rest of the project was a bit of a rush for the PARF opening on August 8, so I completely ignored posting. Here we go with a summary. 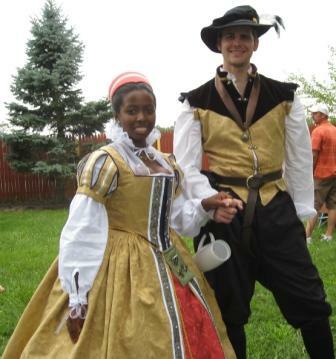 On opening day, the husband looked darling in his ensemble of black twill Venetian breeches, black velvet/gold damask doublet, and black twill hat. I did have to break into my $25 allowance for closures , when I realized that the bucket of buttons wouldn’t cut it. I also picked up a length of braid for the neckline. The total was $9.41. The Venetian breeches were made of black cotton twill and lined with white cotton remnants. I used gold plastic buttons and chose a concealed button fly so that he can wear them across persona classes. 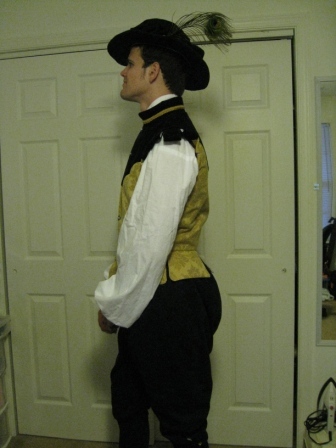 Aside from extending the pattern for his height, the breeches went together smoothly. 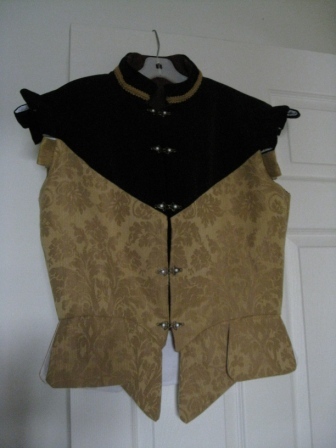 Due to the sizes of remnants that I had available, the doublet was made of gold damask on the bottom and black velvet on the top. After sizing, I slashed the pattern on a diagonal between the arm and the center front. I added seam allowances during cutting of the fashion fabric and stitched the pieces together before flatlining. 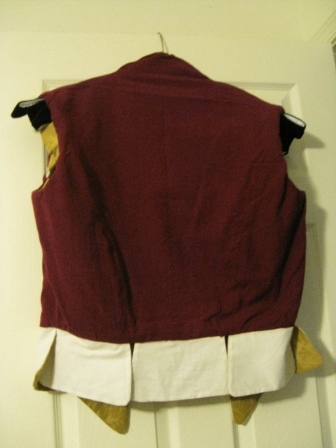 The doublet lining is maroon cotton leftover from a previous project, but I lined the waist tabs and shoulder tabbed loops with white cotton. The center most loops are black velvet and the edge tabs are gold damask. I made two strips and then cut the tabs down to size. I don’t think I graduated them properly, but they look fine to me. I didn’t have any closures in my stash fit for the doublet, so I went off to the fabric store and found gold closures with pearl bits in them. The gimp was a last minute pick, but the color was good, so I grabbed it. 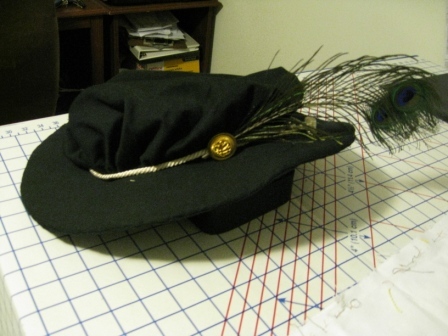 The hat was an iffy addition because of my sordid past with hats, but I had enough twill remaining to put it together. Last year, I bought enough plastic canvas and felt to make a hat for a giant because I just knew I could do it. Unfortunately, the hats that I finished to completion were all misshapen, so I abandoned hats all together. I pulled ‘that’ bag [of plastic canvas] out of the back of the closet. I used remnants of off-white cotton for lining, and ran just a bit short. As long as he doesn’t wear the hat inside out, no one will notice. Not thinking, I used green bias tape for the seam, which, of course, can be seen in every picture more prominently that I expected. The husband doesn’t seem to mind, so I’ll keep it on for character. I had white cording and peacock feathers lying around from a few other unstarted projects, so I attached them together with a decorative plastic gold button and tied on the new had band. 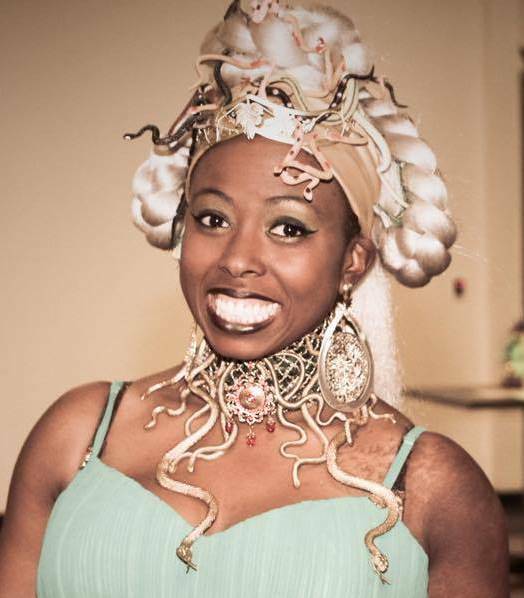 While I had a reasonable amount of fabric in my stash, this project helped me realize that I have reached a point in my costuming where I could/should have more. I was able to make a couple of pieces to extend the husband’s wardrobe, for which he was appreciative. My ID III entry is just three pieces, completed between 7/01 and 8/08. UPDATE: This project received an Honorable Mention in the competition for “Cutest Couple”. I’ll take it! AWWW, you guys are cute. I love all of your costumes. Very nicly done! I admire your work and tenacity. I am working on a “Queen Elinor” for the girl my son took to prom 3 years ago. They still date though. I got sick and used that as a excuse not to work on it. The thing was darn heavy, fully lined with train and lined double trumpet sleeves. It topped the scale at almost 20#. This New Year I decided to finish it. So I ripped it down to the basic dress. I am lining the top only. The sleeves will be unlined and straight and she can tie on the trumpets if she wants. Just need to add an upper cuff for it. Then I will stand at the and wave bye-bye. No tears. When she drives off I’m opening the Maker’s Mark. Then one drink and I start on all the projects I have left unfinished.